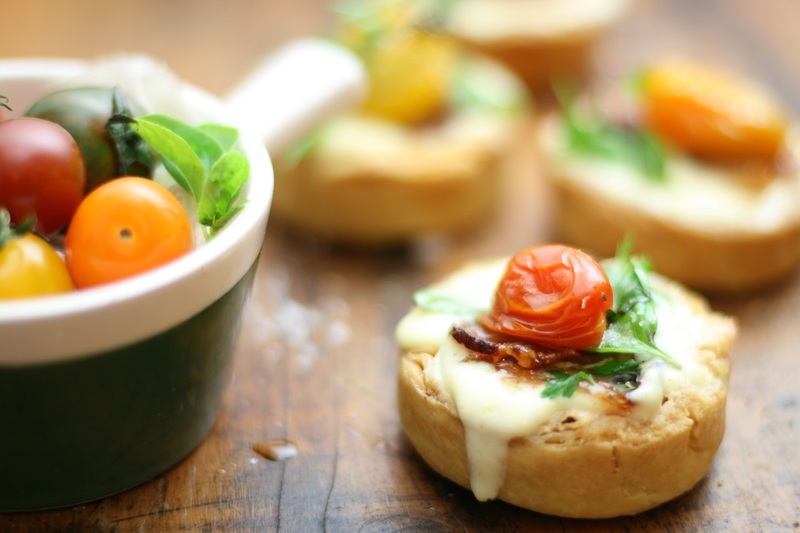 Heirloom Tomato Tarts with Bacon and Goats Curd are for the height of tomato season. If you grow your own tomatoes you will understand what height of the season means, yep a glut. You will need lots of tomato recipes to get you through . 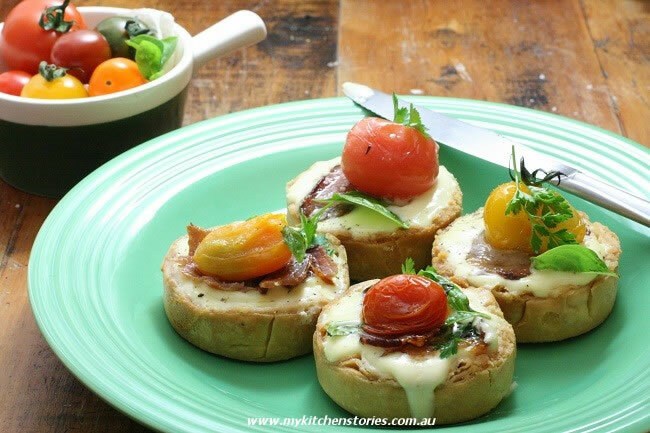 This is a perfect lunch or entree to serve the family or special guests. 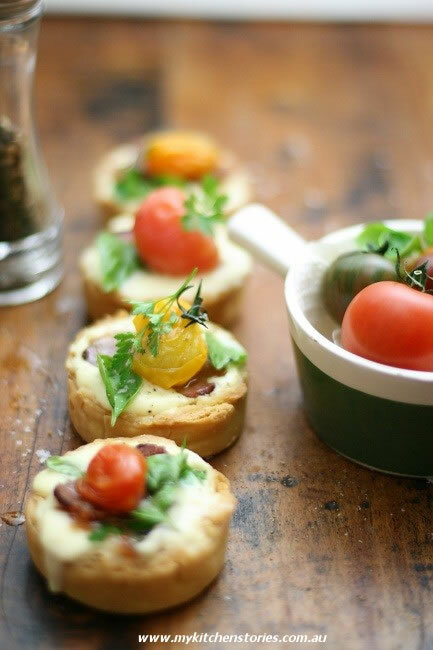 It showcases the tomato in an indulgent way. It’s made with Goat’s curd. Goats curd is a tangy goat ricotta. It’s a delicious fresh version of Goat’s Cheese that is great for baking but just as delicious spread on toast or in tarts like this. It’s a very popular cheese for chefs because it is fresh and creamy and even people who are not so keen on more matured or washed rind Goat’s cheese usually like this curd. Curds are the solid bits you get when you separate the curds from the whey in milk (either through a souring process, and/or with rennet). It doesn’t matter if the milk is from a goat, or a cow, or a sheep, or a camel. ( true) The curds can be eaten as fresh cheese, or they can be processed further into other kinds of cheeses. The kind of cheese the curds eventually become depends on the processing (e.g., addition of bacteria, pressing, salting, etc. ), and sometimes on the species of animal the milk came from. You can find curd in a good cheese store or deli, but you can also find it in the bigger supermarkets with a cheese section. 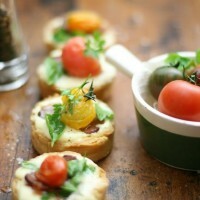 I’ve used heirloom coloured tomatoes to make my tarts but use any tomatoes you may have. 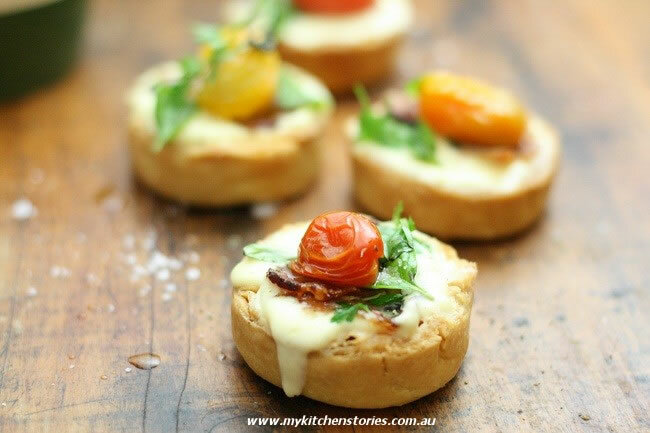 The tarts look pretty with cherry sized tomatoes but if you have a glut of another type of tomatoes , cut them into nice chunks or crescents and use those instead. I used a store bought beetroot relish but you could grate some beetroot and add some balsamic vinegar and a bit or sugar for a raw crunchy salad version. Put the flour and butter into the food processor. Process until the mixture resembles breadcrumbs. Turn out and rest minimum 1/2 hour or overnight. Bake the cases blind till golden. Cut the bacon into 5-6 cm pieces and saute till crispy drain and keep warm. Put the tomatoes into the oven and roasted on 180 C/350 F ( this could be at the same time as the tart cases) until just cooked ( approx 10 min or until just bursting). Once the pastry and tomatoes are roasted turn the oven down to 160 C/ 340 F.
Mix the curd, egg and thickened cream in a bowl with seasoning until well combined. Spoon some of the mixture into the tart cases filling almost to the top. Bake for approx 20 min or until just set. 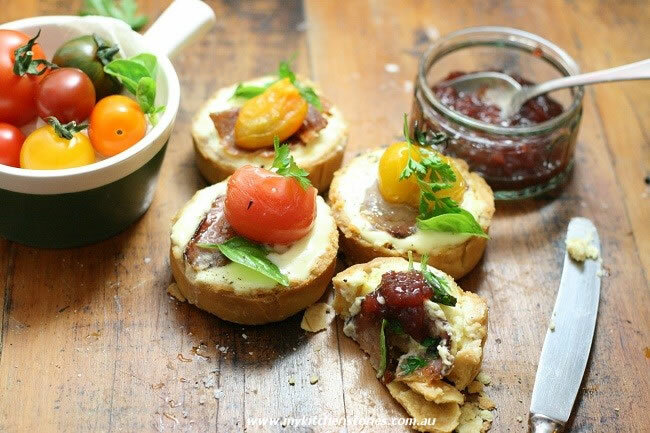 Serve these tarts with beetroot relish. To vary, you could add parmesan to the curd mixture,or chopped soft herbs. Serve with or without bacon .